New products and versions for the modular safety gate system from Pilz - safety gate sensor PSENmlock with series connection, pushbutton unit PITgatebox and escape release - systematic protection for every gate! The modular safety gate system from Pilz offers individual safety gate solutions that are ideally tailored to the requirements of the most varied applications. Users benefit from an economical series connection, rapid diagnostics, additional control and pushbutton elements and an optional escape release. Different components can be combined to fit the application. So users achieve an individual safety gate solution, ideally tailored to the respective application. The safety gate system now includes the safety gate sensors PSENmlock with series connection and the pushbutton unit PITgatebox. The core of the modular safety gate system is made up of the safety gate sensors PSENslock and PSENmlock. The former offers safe position monitoring with process guard locking in one system, while PSENmlock can be used up to the highest category thanks to the safe interlock and safe guard locking for the protection of personnel and processes. The safety gate system now also includes the version "PSENmlock with series connection" for the safety gate sensor PSENmlock for safe interlock and safe guard locking. 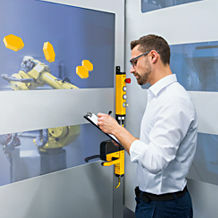 Used in combination with the diagnostic solution Safety Device Diagnostics (SDD) from Pilz, targeted control of individual switches or gates is now also possible – completely in the spirit of Industrie 4.0. Expensive individual wiring in the control cabinet is no longer necessary. This safety gate solution not only offers an economical series connection, but also high availability thanks to the comprehensive diagnostics. As a result downtimes can be reduced considerably. As optional accessories for the safety gate sensors PSENmlock, there are two new versions of the escape release available, which can be combined with all types of the safety gate sensor: A bar is used to connect PSENml escape release directly to the base unit, while PSENml escape release cordset is mounted on PSENmlock via a pull-push wire. The latter enables the installation of the safety gate system and escape release to be physically separate. It is particularly easy to install and low-maintenance, as the pull-push wire does not have to be under tension. So both versions of the optional escape release ensure maximum safety. The new pushbutton unit PITgatebox for simple operation and control of safety gate sensors is part of the safety gate system and rounds out the system. The pushbutton unit enables the control of commands that activate, stop or reset your machine or system, for example. Thanks to the slimline design, the robust control unit can be installed quickly and easily on standard profile systems. The PITgatebox is available in a number of versions and with its robust die cast zinc housing is particularly resistant to shock, vibration and collision. Its slimline housing enables space-saving installation. Each preconfigured version with various combinations of pushbuttons, key switches and E-STOP pushbuttons provides maximum flexibility for individual applications. The safety gate system package contains not only both safety gate sensors, but also various accessories such as different escape releases and handle types for swing or sliding gates. A pushbutton unit that can be used with both safety gate sensors completes the system. Together with the diagnostic solution Safety Device Diagnostics (SDD) and in combination with Pilz control technology, the result is an economical. complete solution for the safety gate sector. Pilz is exhibiting in Hall 9, Stand D 17. The range of safety gate systems PSENmlock for safe interlock and safe guard locking now offers a new version for series connection.